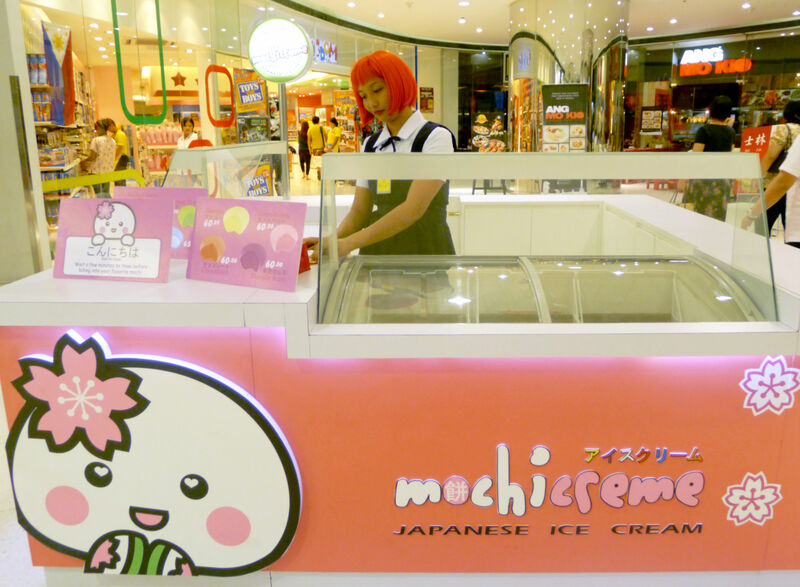 My friend Sumi of ThePurpleDoll.net recently wrote about her Mochi Creme Japanese Ice Cream at SM Mega Mall. I was really looking forward to trying it myself as I enjoyed my Mochi Ice Cream experience at Sophie’s Mom. Thus, it was quite serendipitous when I saw their stall at The Podium last Friday as I was walking aimlessly around. Actually, the first thing that really caught my attention was the girly pastel pink booth in the midst of Podium’s grey and glass interiors. Of course, who can also ignore the girl with the bright red wig? I was immediately drawn like a moth to the flame and before I knew it, I was making conversation with the girl about mochi ice cream. Apparently, their best selling flavor is Purple Yam. Not really into yam myself, I looked for other options. All the colors looked yummy, actually. Pastels always look delicious to me. 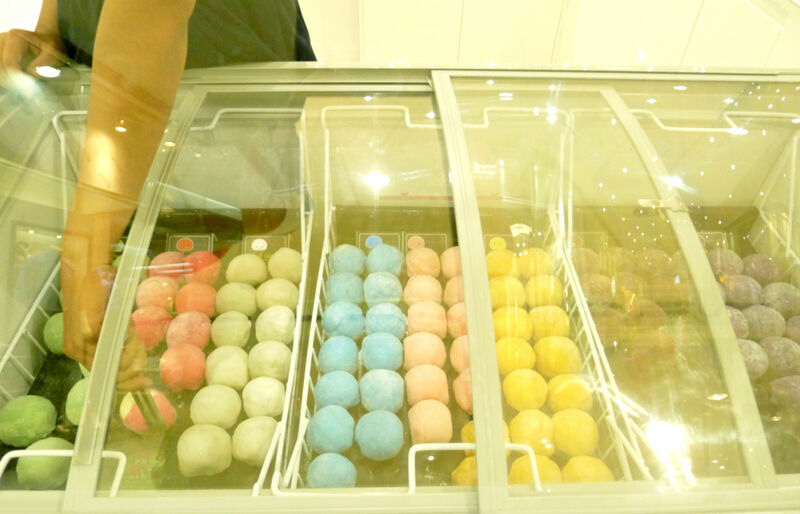 However, before I could pick the pink color, I was told that their other best seller is the Blue Vanilla. Hearing the word “vanilla,” I immediately perked up. Ha! I’d buy anything that says vanilla on it so that sealed the deal for me. 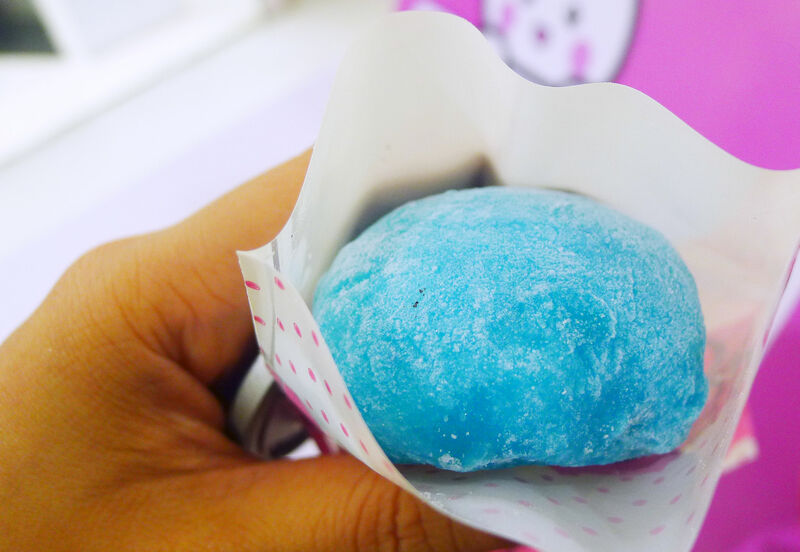 I got the Mochi Creme Japanese Ice Cream in Blue Vanilla and it did not disappoint. After the mochi thawed down, I bit into it and savored the yummy vanilla creme that spilled it. It offered me great comfort when I needed it most. Unfortunately, I just have a bit of a problem with the price. My blue vanilla cost me PHP65. 😦 Pretty expensive right? 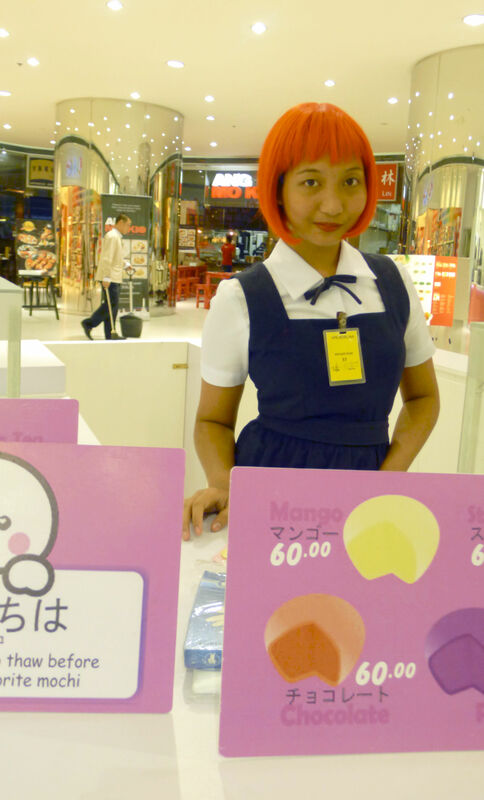 I would still buy it though because I like mochi and I like ice cream. Finding the two in one food item is a dream come true. 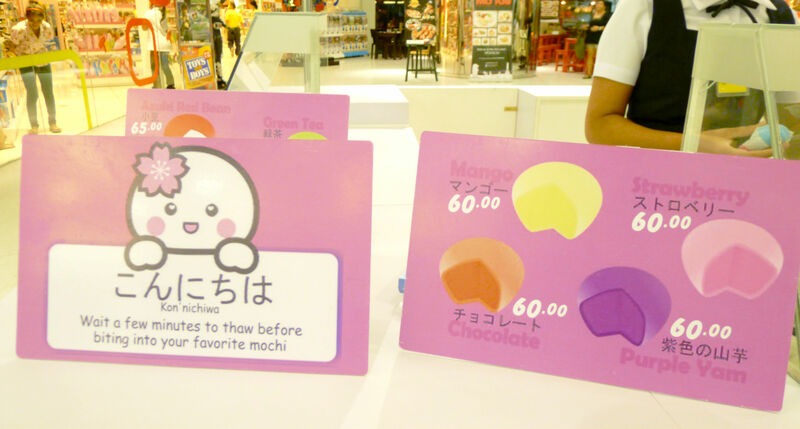 kumain na rin ako ng mochi ice cream, had green tea flavor. gusto ko rin siya pero yeah, i think around 60 pesos din yun. agree ako na medyo mahal nga, pero ang kyoooot nila kasi rainbow colors! I want to try this too! I’m very intrigued by the Blue Vanilla! If not for your mention of Podium, I would think it is taken in Japan. Hehe. I would love to try, and I hope they open in Eastwood! ang cool nung nangtitinda. nakawig pa. hehe. Ang lakas kumosplay ng tindera. Haha. 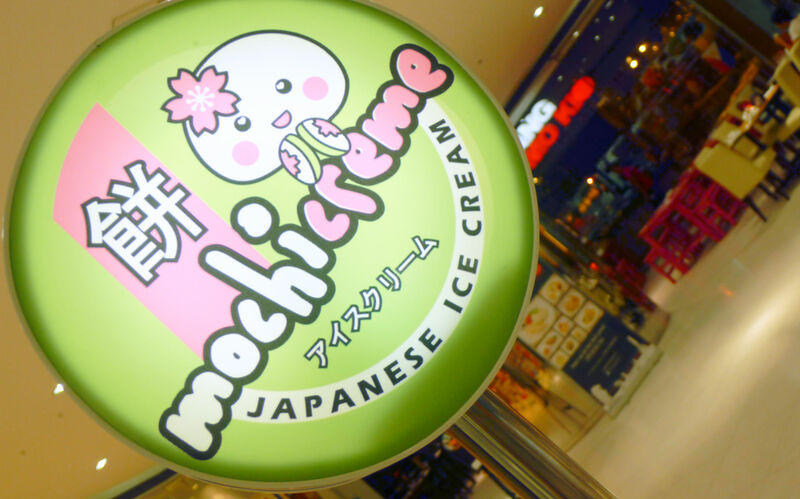 Very cute Mich, I’m officially craving now. I want some. Haha. Looks delicious. Can I bite it without any problem even if I have braces. Lol. Am I worrying too much? 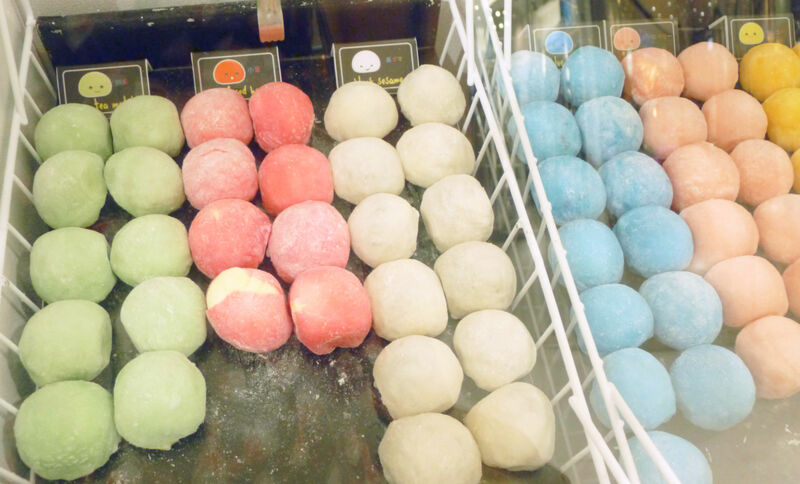 Another mochi stall! How does it compare to mochico? yum ,sarap naman bumili ng ice cream.